Every few months I get a call from a CEO asking for a private meeting to talk about the company’s current CMO. Typically, the CEO has grown unhappy with the CMO and is thinking about making a change. But first, he or she wants to talk through the various options and get a quick overview of the landscape for the very best senior talent. It worries me that these calls come so regularly. That might seem counterintuitive, given that the livelihood of executive recruiters depends on a certain amount of turnover. But my colleagues and I are unhappy about how frequently CMOs fail. When they do, it’s largely because of poorly managed expectations. CEOs today want CMOs to be growth officers, but not all marketing executives have the capabilities, experience, and leadership style needed to lift revenues and profits and simultaneously learn to navigate a new culture. Keeping everyone focused on the job specifications is part of the challenge. Too often the hiring process turns into a popularity contest that favors charismatic candidates. Charisma is important, but if it prompts a company to hire someone whose skills don’t line up with what’s needed in the role, it increases the odds of failure. When my colleagues and I take these meetings, we talk about issues specific to the company. 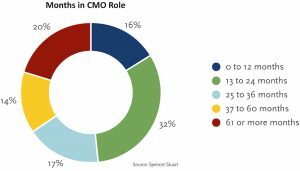 But much of the discussion focuses on the broader CMO landscape, including whom we view to be the greatest CMOs and where the best marketing talent resides. One of the first things I ask is what kind of marketer the CEO really wants. Someone to simply curate ads? Someone who is skilled at engaging consumers using modern digital marketing methods? Someone with prior P&L experience who can launch innovative new products and profitably grow revenue? My objective is to help the CEO understand that the roles CMOs play vary widely by company and industry. I often bring a chart that reflects this range of skills and competencies and ask CEOs to identify the ones most critical for their companies. As an executive recruiter, I’ve placed nearly 500 CMOs in their jobs during the past two decades. As you might expect, I’ve grown close to a number of them, witnessing not only their successes but also their failures. On the basis of what I’ve seen, I believe that the CMO role has changed more profoundly than any other C-suite position has. The size of many marketing teams has grown exponentially. Some CMOs now have thousands of people reporting up to them, which rarely was the case in the 1990s. Because marketing has expanded to include data and analytics, the composition of the teams now varies tremendously, too. Often they include PhDs in math, sociologists, and designers, along with more-traditional marketing staffers. In many industries the sheer scope of a CMO’s responsibilities has swollen as well. In airlines, for instance, many CMOs have broad commercial responsibility, touching virtually everything outside the cockpit doors—from sophisticated dynamic fare pricing, to credit card partnerships and loyalty and mileage-awards programs, to the extras like Wi-Fi and additional legroom. The other significant change is the ongoing blurring of channels caused by the growth of e-commerce and the reach of social media. New marketing tools give CMOs more ways to win customers, but these same tools give vocal (and sometimes angry) customers a platform. That can create a new threat to brands and the CMOs who manage them. Many of the people who flounder in CMO jobs are really smart, talented executives, which is why their failures are especially frustrating. To increase the odds that new CMOs will succeed, we help them construct strategic onboarding plans that ensure faster, more-productive starts. We also advise them to develop deep relationships with their C-suite peers. And we counsel CEOs to establish ambitious but achievable expectations with the CMO. Getting the right CMO into the right role at a company can be catalytic. The results—for the CEO, the shareholders, and the customers—can be dramatic. And of course, for me, helping clients think through the future of marketing for their organizations and find the right person to lead them into it is one of the most satisfying parts of my job. Greg Welch is a senior partner at Spencer Stuart.